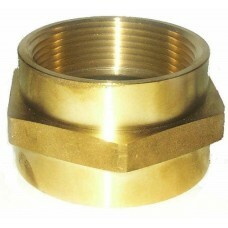 These cast brass adapters are normally in stock for quick shipments. We offer many different types of thread choices to accommodate our customers throughout the USA. We maintain a card file in our office with thread types used by various cities throughout the USA. If your thread type is not shown below please give us call to discuss your requirements. We want to be your adapter supplier and stand ready to meet your custom requirements. National Pipe Thread Taper (NPT) is a U.S. standard for tapered threads used on threaded pipes and fittings. NPT is not available on swivels.